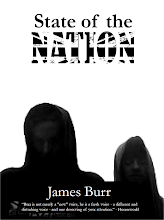 James Burr: "State of The Nation" update. I've finally finished the first draft of Dawn of the Brain Dead. As always it'll need a lot of revision (I'm a BIG fan of revision) but I'd say it's about 70% there (unlike The Lost Draft I did 2 years ago which was almost 90% there, before Bill Gates' incompetence consigned it to electronic oblivion....Grrrr. My hatred for the man still seethes uncontrollably). It's got a nice Chuck Palahniuk vibe to it which goes well with the main plot and feel of the story. That said, things are gearing up for another busy year at work. Technically, I still have four weeks to go before all creative thought will have to be shut down (it's going to be a Hell Year - not only do I have my University job (and the attendant overtime that that involves) but I've also got to do half a Master's degree in Dyslexia and Literacy difficulties, I've got three Examiner positions which kick into life at various points of the year, I've got my online tutoring job AND I may get an Associate Lecturing post with the Open University, if I'm lucky. It's a lot of work and it's all pretty interesting and enjoyable, but it does mean anything creative will have to stop for 9 months.... except revision of course). But I'm going to start having to do a day a week starting next week until the term proper kicks off. Still, hopefully I'll have the big draft of Brain Dead to revise, the draft of the First Love, Last Love radio play (which is getting there) and also, if I'm lucky, I'll have a draft of The Continuing Staggering Adventures of Bulldog Carruthers to work on, too. At present I've finished the research for this one and I'm just outlining the plot. But I'm looking forward to writing it and have been reading lots of W.E. Johns' Biggles stories to get my mind in that "Biggles mindset." Given what happens, that style should be fairly effective in highlighting the themes of the story and I should be able to adopt my "sneer at the characters" voice to a certain extent, which I always love using and often results in unintended humour. Still, only 4 weeks to do something which I'm predicting may be 15,000+ words. It'll be tight.